Air Fryer Frozen Fish Sticks. Do you get excited by fish sticks and want to cook frozen fish sticks in the air fryer? Do you want them crunchy and not soggy? 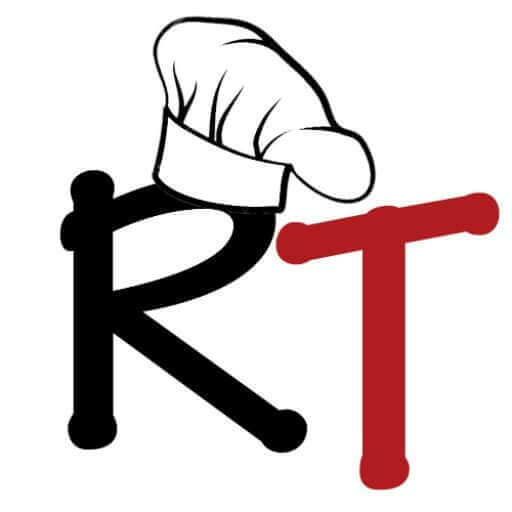 Then you’ve come to the right place as RecipeThis.com puts them to the test in their air fryer. If you’re following along with our frozen food in the air fryer theme this month, then you will know that we have had some amazing treats so far. We have cooked air fryer frozen sweet potato fries, air fryer frozen sweet potato wedges, air fryer frozen breaded mushrooms and today is the day for air fryer frozen fish sticks. Or as us Brits called fish sticks when growing up it was fish fingers. Most kids in our town would have fish fingers for dinner when they came home from school with oven chips and baked beans. It was yummy and we absolutely loved them. But there is also the hangover crew and as adults you know fish sticks as that hangover sandwich that you had when you were feeling worse for wear. You would have it in between two thick slices of white bread, a fried egg, butter that you forgot to get out and didn’t spread very well and sometimes some mayonnaise and cheese too. Do tell me at the bottom in the comments how you have your frozen fish sticks or if you call them fish fingers like we do, as we would love to know! I always remember my mum cooking my fish sticks in the oven. They would be lined up on a big grill tray and it would be lined with silver foil to save on cleaning time. It was the same grill she used for cooking bacon and sausages too. It would be served with some oven chips and it was never perfect. You see the problem was that fish sticks and fries was never meant to be cooked in the oven. That was the lower calorie approach, but it never tasted as good as deep fried. But the air fryer, has special powers and it changes things. You see it makes you think that you have just had our food deep fried, even though you haven’t, and it adds that amazing crispy texture that you’re longing for. Any frozen food that you have eaten that has been cooked in the oven, has this problem and can be easily transferred to the air fryer instead and that’s what we do now. We rarely use our oven and it mainly gets used now for keeping food warm, or in winter when I want a casserole cooking. We used a local Portuguese brand for our fish sticks. The one we chose was big enough to feed the 5 of us, was good value for money and had a lot more real fish in it than the other brands. If you’re in the USA I would recommend the Gortons brand. The size of frozen fish sticks rarely changes, and they can easily be cooked on the time I have mentioned below regardless of which brand you’re using. Call my times a universal indicator for cooking frozen fish sticks. Cooking air fryer frozen fish sticks is so easy and OMG so tasty too. They are crispy just like deep fried fish sticks are and you will want to cook them all the time in the air fryer. It is all done for you and you simply place them in your air fryer grill pan and let the air fryer do the work for you. If you don’t have an air fryer grill pan, then they are a MUST. It stops the food sticking to the air fryer basket and is so easy to wipe clean when you’re done. Also, from the picture above you can see, that you can cook 9 frozen fish sticks at once via the air fryer grill pan. 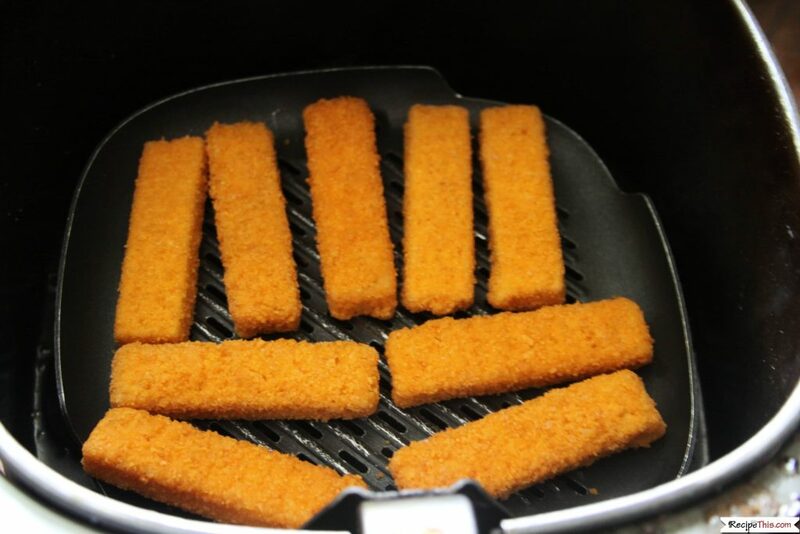 Open the frozen fish sticks bag and place 9 fish sticks onto the air fryer grill pan. Cook for 8 minutes on 180c/360f. Make sure you don’t stack fish sticks on top of one another as they will stick together and not cook properly. We found using our air fryer grill pan that we could add 9 at a time. We made our frozen fish sticks into sandwiches. To do the same fry an egg in the frying pan while your fish sticks are cooking in the air fryer. Then add butter to 2 slices of thick white bread, the fish sticks once cooked, a fried egg and finish with some mayonnaise. A fish sticks treat that you MUST try! When placing frozen fish sticks into the air fryer, make sure any crumbs stay in the bag as it will make your air fryer very dirty and give a burning smell.